Barbados is heavily invested in CLICO – good as gold, I tell ya! Moody’s Investors Service is reviewing its credit ratings on Barbados’ foreign- and local-currency bonds for possible downgrade amid mounting government debt, predicting the Caribbean island’s ability to cover its debt will worsen in coming years. Criminal Probe Into CLICO – The Plot Thickens! Bad judgment or criminal wrongdoing? The Government of Trinidad and Tobago has launched a criminal investigation into the house of cards known as CLICO and has hired one of the most respected forensic investigators in the world: Robert Lindquist. 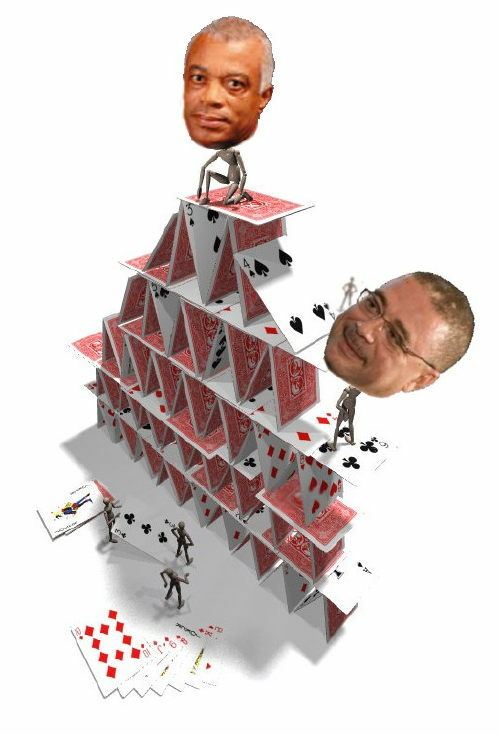 We say “House of Cards” because in the past few days things seem to have started coming apart even more than thought. Sylvia Baldini-Duprey, wife of CL Financial big shot Lawrence Duprey, resigned her position as deputy chairman. Perhaps her four multi-million dollar Miami homes (yes, count ’em FOUR homes) were becoming too much to clean on her own. Or perhaps she needed more time to make fish cutters for her husband’s lunch. Or maybe the heat was getting a little hot. It seems that much of the declared asset base of CLICO is over valued – having been invested in Florida swamp land. Yup, the breaking news of the last few weeks indicates that much of the declared “assets” of various sectors of CLICO are nothing more than overvalued “loans” made to other CLICO entities! Meanwhile the Barbados Government of David Thompson provides financial aid to CLICO even though the company has failed to publish public financial statements as per law. But don’t get too excited, folks. You know how things are ’bout hey: lots of shoutin and fist shaking, but nobody goes to jail in Barbados for this kind of stuff. And you know who will pay for it all. Don’t forget the Prime Minister’s rule: Privatize Profits, Socialize Losses!